Highlighting a Content Area makes that box appear to stand out from the rest of the content blocks. Only one content area can be highlighted at a time. 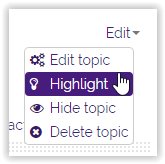 Choosing another content area to highlight will also remove the highlight on the previous content area. NOTE: This option only appears if you have chosen the Topics format in your Course Settings. If Weekly Format is chosen, the highlight will automatically be placed on the content area for the current calendar week. 3. Locate the desired content area and click the Edit drop down menu. Click highlight. 4. Click the icon again to remove its highlighted status.